Muslim Voices of Philadelphia is a community multimedia project exploring the rich histories of Muslim communities in the Philadelphia area. The project includes three components: a series of short community media projects produced with local Muslim communities, a 60 minute documentary about late 19th and early 20th century Muslim communities in Philadelphia, and an outreach campaign including a companion book and website. Muslim Voices is a project of Scribe Video Center, a multi-faceted media arts center providing access to high-quality instruction and video equipment for media production. Independent producers, emerging video artists, media activists, and community organizations are given a place to meet and collaborate on creative media projects that explore community issues and celebrate local culture. Philadelphia is an important historic center for Islam in America. In addition to the presence of major figures like Malcolm X (El-Hajj Malik El-Shabazz), and movements like the Nation of Islam, Sufism and the Ahmadiyya movement, vibrant and diverse Muslim populations have emerged and settled in the region over many years. 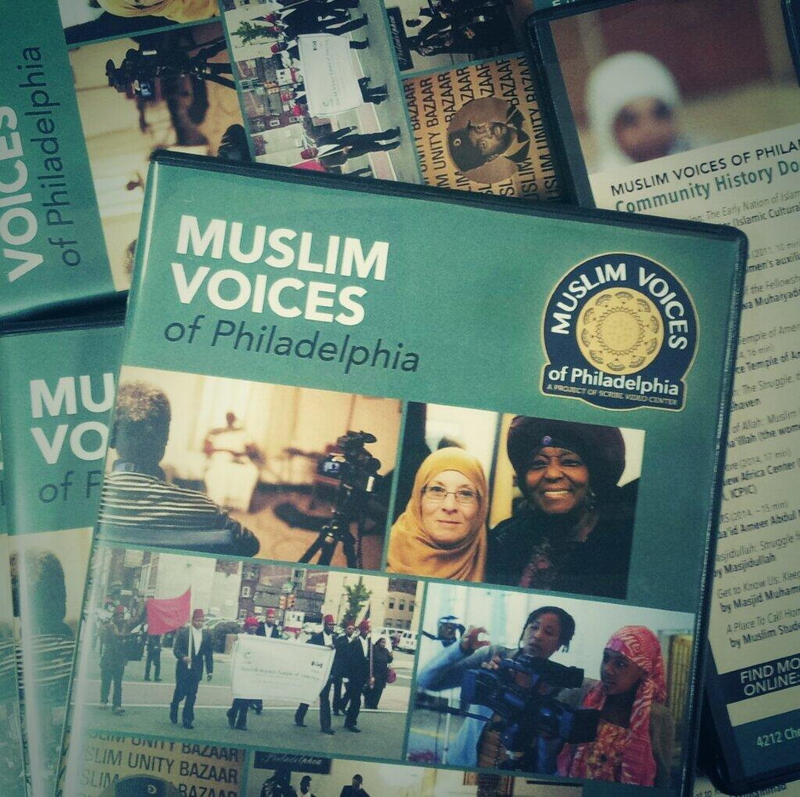 Muslim Voices provides media resources to Muslim groups in the city so they may share their histories, stories, achievements, and challenges with a broad audience – stories that are both part of the history of Islam in Philadelphia and the history of the city itself. Scribe has developed strong relationships with Muslim religious and cultural organizations in the region to collaboratively develop media that encourages dialogue, promotes historical context, understanding, and fuller representations of Muslims in Philadelphia. These relationships include: Bawa Muhaiyaddeen Fellowship and Mosque (a Sufi fellowship founded in 1973); Lajna Ima’illah (the women’s auxiliary of Ahmadiyya Muslim Community with roots in India); Masjid Freehaven (founded in southern New Jersey near a former Underground Railroad site); Masjid Muhammad (site of the Muslim League of Voters); Masjidullah Masjid (a large African American Masjid in the West Oak Lane section of Philadelphia); Moorish Science Temple of America, Inc., Temple #11 (established in 1928, one of the earliest MSTA temples ); Muslim Student Association at the University of Pennsylvania (the second oldest MSA in the U.S.); QAAMS – Qu’aid AmeerAbdul-Majeed Staten Hajj Foundation (founded to support youth travel to attend the Hajj pilgrimage in Saudi Arabia); The New Africa Center – Islamic Cultural Preservation and Information Council, (home of the Muslim American Museum, focusing on African American Muslims). Muslim Voices of Philadelphia includes a series of nine short community media pieces, produced with local Muslim communities, utilizing interviews and oral-history research to discuss contemporary practices and experiences. Collaborating with media arts producers and scholars, they explored how to best tell their stories, and how to address their complex cultural experiences, including how they choose to define themselves. These pieces focus on diverse topics, including key organizational and institutional histories, immigration, conversion stories, and the experience of women in Islam. These works will be exhibited online and through screenings at community sites, media arts centers, educational venues and cultural organizations, as well as packaged for broadcast on public television stations. An extended documentary explores historical Muslim communities in Philadelphia during the late 19th and early 20th century, engaging local scholars and archival material to bring this important history to light. This work is created for broadcast on public television and screenings at national museums, media arts organizations, and film festival venues. To ensure Muslim Voices reaches regional and national audiences, a companion book, a website, and an outreach campaign will accompany the community history media projects. The companion book will be based on oral history interviews conducted by participating Muslim groups, while the website will include community media pieces, interview transcripts, and resources for educators including detailed study guides and companion book excerpts. The national outreach and engagement campaign will expand on Muslim Voices of Philadelphia as a model for collaboration between media arts producers/educators with members of local Muslim communities in four regions known for their large, diverse, and historic Muslim communities.